It is taken for granted here that physical ugliness is connected to moral ugliness, and the two ideas are linked by a Latin tag – ‘watch out for those God has marked out’ – which suggests that the former is divine judgement for the latter. 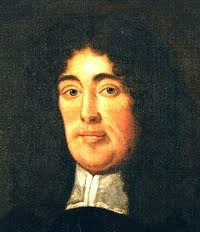 Oates (1649-1705) was the principal informant for the ‘Popish Plot’. The so-called plot was a fabrication which engendered anti-Catholic hysteria and led to the executions of a number of people (including Richard Langhorne, who I mentioned when blogging about banking failures): Oates’s false evidence helped condemn them. A church vermilion and a Moses face. his face was flat, compressed in the middle so as to look like a dish or a discus; on each side were prominent ruddy cheeks; his nose was snub, his mouth in the very centre of his face, for his chin was almost equal in size to the rest of his face…The rest of his figure was equally grotesque; more like a beast’s than human, it filled people with contempt. This is beginning to look familiar, particularly the implausible claim that Oates’s mouth was the geometrical centre of his face. I don’t know if any of these writers ever saw Oates, but images of him circulated (see here for some examples) and it is a well-attested phenomenon that memories can be rewritten by subsequent information. For a time Oates succeeded beyond his dreams and was genuinely honoured as the saviour of the nation, but the sordid reality of his life in which there were no great secrets to uncover, only back alley meetings, stealing, begging, and poverty, vice, fear, and hatred, and above all failure, soon caught up with him.